As usual, the CDA will be represented, walking in the parade. As we walk, we'll be passing out dog chew/treats to anyone along the parade route who has a dog with them, or lets us know they have a furry friend waiting at home, who would enjoy one of the chew treats. Additionally, this year, we'll be setting up a booth at the country fair in Chelmsford Center. Come visit us on July 3rd and 4th at our tent, which will be located at the corner of Westford Street and Academy Avenue. Over the years, I have heard from folks that have experience doing fundraising, and most of the people that get CDA e-mails have been patiently waiting for a way to help. I believe that time is now. The CDA Board members walked through the DPW lot on Richardson Road, last night, with Paul Cohen. There is still a lot of planning and work to be done, but the site looks good for our plans, and Paul is confident that the DPW will be moved out next year. Potential site Walkthrough – Tonight! Despite the rain (it is supposed to taper off, or at least slow down by this evening), we WILL be having a walkthrough of the DPW site on Richardson Road. 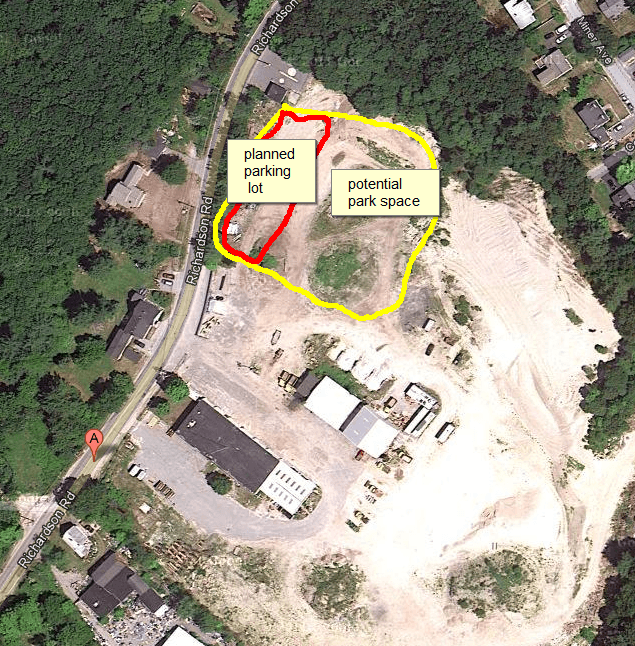 Based on our meeting, last month, with town manager, Paul Cohen, this is our best-choice potential site for the dog park in Chelmsford. On behalf of the Chelmsford Dog Association, I would like to thank everyone in the community who is helping us with our goal to build a Dog Park for Chelmsford. A special thanks goes to Countryside Veterinary Hospital for hosting our Flea Market in May and to Walgreen's Pharmacy for sponsoring their Second Annual Dog Rally on June 9. These two events raised just over $1300.00, which will be put toward supplies and equipment for the future park. 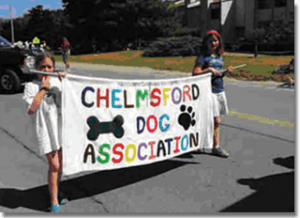 Thanks, everyone, for coming out to the CDA's Second Annual Dog Rally, sponsored by (and at) Walgreens in Chelmsford. Many thanks to all of the vendors and special thanks go out to Walgreens for sponsoring this event for the second year. There are new galleries up with pictures from the Rally as well as all of the wonderful Coloring Page Contest entries. 2012 CDA Coloring Contest “Scoop the Poop” Campaign -- Share your creativity by coloring our current contest page and sending it to us! You can use crayons, markers, colored pencils – any kind of color is good. One entry per person, please. Contest is open to children ages 12 and under and winners will be selected at the 2nd Annual Dog Rally on June 9.